We offer on-site and off-site programming for children's groups including school groups, scout troops, and camp programs. Check out our programs. Can't find what you are looking for? We can help you develop a program to fit your needs. The cost of programs varies, but a $30 nonrefundable deposit locks in your date and program. Please contact our Director of Interpretation via email cnicastro@clockmuseum.org or call the museum 860-583-6070 to discuss the details. Are you studying state or local history? Are you looking for a program to help your students understand the development of instruments to tell time or the Industrial Revolution? Do you have a group that wants to learn more about proper handling of artifacts or the simple rules for museum behavior and etiquette? We have interactive programs that can help you achieve your goal! Give us a call (860)583-6070 to discuss the details. This hands-on program introduces the students to the concept of mass production and the key role that it played in the advancement of the clock and watch industry. It is suited for grades 3-5, but can also be adapted for older students studying the Industrial Revolution. It is conducted as an off site program. A master clockmaker and an apprentice are pitted against workers on an assembly line to illustrate the benefits (and drawbacks) associated with artisan-made vs mass-produced clocks. 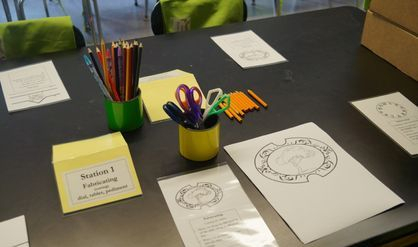 Through this timed activity, students will be guided to discover the similarities and differences between the two processes used to produce a clock. 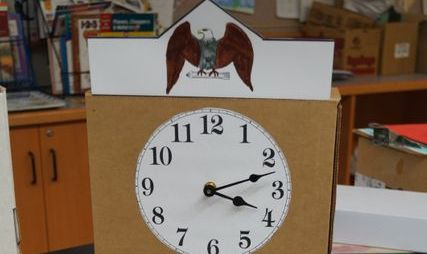 Given the same materials to make a simple box clock, each group will be encouraged to follow directions and take pride in their work. This is not a race against the clock, but a hands-on illustration of the merits associated with the system of mass production used in the early days of the clock industry. Typically, the master and apprentice team will complete one complete clock and the assembly line workers will produce four or five clocks in the same (simultaneous) amount of time. Sundials, Time Capsules , and Artifact Hunts.....Oh My! 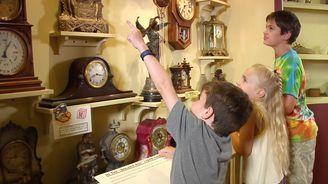 Whether you are studying how to tell time, the evolution of time telling and time telling instruments, inventors and their inventions, the Industrial Revolution or community development, we have a program for you! Most of our hands-on programs can be conducted on or off site, so call the museum to discuss the possibilities today!